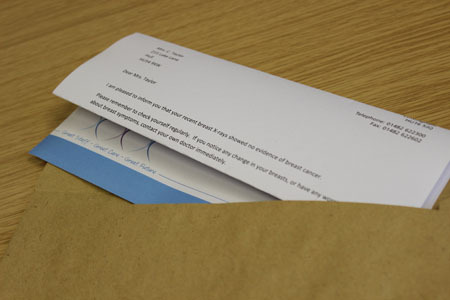 At the Humberside Breast Screening Service, we understand that you might feel worried while waiting for your results. Your results should be with you within 3 weeks following your appointment, but this depends on how fast our specialists are able to look at your x-rays. We’re often able to send them sooner, which means some women get their results letter a lot sooner than they were expecting. If you do receive your results sooner than expected, there is no need to panic — it just means we’ve looked at them within a day or two of your appointment. 24 out of 25 women who are screened receive an ‘all clear’ result. Receiving this result means that we have found no abnormal changes within your breasts. You will be due for your next routine scan in 3 years’ time. Rarely, we may need to call a woman back for a further mammogram for technical reasons. Receiving this result means we have been unable to assess your scan results, usually due to movement which causes blurring of your x-ray images. It does not mean that we have found any abnormalities in your breast tissue. We will invite you back to the clinic for a further x-ray and will send you the results again as usual. 1 in 25 women will be invited to an assessment clinic for further investigations. If you receive this result, it means we have found an area on your x-ray that needs further tests. It does not mean that you definitely have cancer. 3 out of every 4 women who come to the assessment clinic are found not to have cancer.